The recent increase in ufo sightings, especially in the U.S. have me wondering. Are occurences really increasing? Are we just watching the skys more after the events of Sept. 11, 2001? Or are we just seeing things out of paranoia due to the recent events? Just another 'point to ponder'. of geese could fly. There appeared to be a black "smudge" behind the object. I at first thought this might be a black vapor trail, but the "smudge seemed to move in tandem with the object but didn't linger in the sky. As we got closer I saw an acute triangular shape with blurred indistinct edges. It moved across the sky at high speed and was out of sight within seconds. I'm a professional with two college degrees and skywatch planes regularly at Memphis International Airport. I've never seen anything to compare with what I saw this morning. 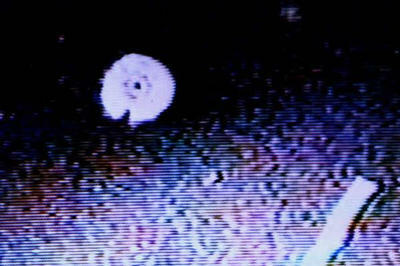 MEMPHIS -- Two weeks later, a Flying Triangle was spotted (November 14, 2001) by the same witness. He says, "Leaving for work at 5:28 AM, I stopped to pick up the newspaper in our driveway. A definite and very well defined and dark lengthy shadow flitted across the driveway." puzzled by what I saw. It appeared that our cat had been startled as well by the passing shadow because she ducked for cover under a hedge. my attention. It appeared to be hovering in place at a spot just east of the Nike plant on the north side of Winchester Road. This area is about five miles away from my home. I slowed down and came almost to a stop to get a better look at the "plane." It was my perception that it was not moving at all. As I studied it, I realized that there was no strobe light on it. It also did not cast its lights ahead of it, as you would normally expect to see the lights of a jet beamed straight ahead. Instead there were three white lights aimed downward. It was then that I perceived that I was looking at a triangular-shaped craft with three bright white lights, one at each corner, and a single red light in the middle of the underside of the craft. BOYNE CITY -- At 8:00 PM my husband and I sat down to watch TV and I heard a loud rumbling sound outside on November 15, 2001. I looked out the window and did not see anything. The next morning our office gal told me she had heard the loud noise at the same time, and saw a flying object over her home heading west that then came back east over her home a second time. BOYNE CITY -- A second witness also reports hearing a loud rumbling noise at 8:00 PM the same night and went to her back door to listen. Thinking it was a jet plane she went back inside but the noise continued getting louder, so she went out again. She only saw stars, and went back inside and asked her husband, son, and son's friend, "Can't you hear that?" They thought it was just a slow jet but went outside to look. They rushed back in, and said, "Come out and see this!" The witness states, "We could see this huge diamond shape UFO with elongated bottom, with a light at each tip and an orange light in the middle." It gradually moved off to the northwest but within five minutes it was coming back. We all watched as it traveled over our home traveling southeast, when it got over Boyne City all of a sudden all of the outside lights started to spin around. Shortly the light on the right side veered off over Lake Charlevoix, which was to the west, while rest of the craft continued on its course, but soon the lone light came back and was heading the same direction as the large craft. It traveled until it was out of sight. I then started calling law enforcement agencies, FAA, and local airports but was unable to find out anything. These were just a little sample of the numerous reports recently. Well.....ideas? 1 Dec 2001 @ 08:42 by bushman : :} I know why they are here. There are specific task associates, "key" or even "critical" assets, in whose efforts possess a substantial effect on task achievement. Controlling these types of assets successfully could make the actual distinction in between achievement as well as failing. This short article offers a few tips about how to handle the program builder. http://www.thepetcompanion.org	Individuals think about your pet shop marketplace because mainly Petco as well as PetSmart after which a lot of little shops, however dog items are in fact offered in several additional areas such as comfort shops, large container merchants such as Wal-Mart as well as Focus on, as well as supermarkets. Therefore the marketplace is actually available, and also the curiosity about dog items is actually skies higher because individuals are investing increasingly more cash upon dog add-ons. Individuals think about your pet shop marketplace because mainly Petco as well as PetSmart after which a lot of little shops, however dog items are in fact offered in several additional areas such as comfort shops, large container merchants such as Wal-Mart as well as Focus on, as well as supermarkets. Therefore the marketplace is actually available, and also the curiosity about dog items is actually skies higher because individuals are investing increasingly more cash upon dog add-ons.